It's been a while since Robert Zemeckis shot actors without motion-capture balls all over their bodies, and the time away is showing. With Flight, the director takes to live action filmmaking for the first time since 2000's Cast Away, a heavy-handed drama that worked mostly because of its central performance. 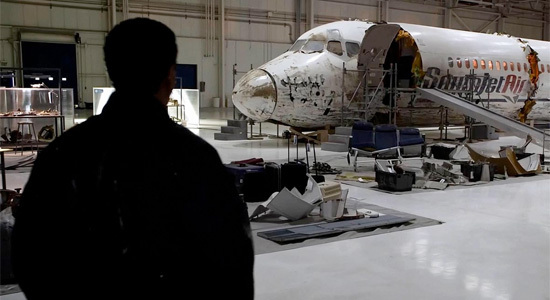 Flight is another heavy-handed drama that works mostly because of its central performance, that being Denzel Washington taking on a role that calls for him to be fearless. He nails it, and what mostly feels like a misguided tale of addiction ends up a showcase for one of our finest working actors. Washington plays Whip Whitaker, a commercial airline pilot who, when we first see him, awakens to a hotel room full of empty bottles and just a little nose powder to take the edge off. We then see Whitaker piloting an airline, the same day but after he's had a cup of coffee and an impromptu screwdriver. Then we see Whitaker perform the impossible, as the plane he's flying breaks mid-flight, and the pilot's quick reflexes and even quicker thinking inverts the plane, lands it relatively safely in an empty field, and saves 96 of the 102 lives on board. But those six lives have to be accounted for, and Whitaker's substance abuse is the last thing he wants to come to light. A heavy burden lay at the feet of whichever actor took on the lead role in Flight, not just for the scenes of rampant alcoholism and the craziness that ensues from that. Whitaker is a hero in this film, a man who's actions have saved lives and is viewed as a saint by some. However, John Gattins' screenplay makes every effort in having you root against Whitaker, his flaws making themselves known at such a destructive pace that you find yourself wanting to see him fail. Whitaker is a character immersed in the gray area between good and bad that you can't help but think Flight wasn't written with this much glorification of the subject its working against. That being alcoholism. God love Robert Zemeckis for what he's been able to accomplish thus far in his career. Even his recent years digging into the limitless possibilities motion capture photography has to offer were interesting in their less-than-stellar results. Flight, on the other hand, does little interesting past the incredibly suspenseful opening moments with the plane crash. As with Cast Away, he does a find job putting you in cabin as its going down, the mixture of camerawork and finely placed special effects creating a genuine depiction of such an event. From there, though, the styles and moods shift between denigrating Whitaker's actions and making drinking and doing drugs the coolest activities on the planet. By the time the film's love interest, played with sturdiness by Kelly Reilly, takes Whitaker to an AA meeting, we're checked out right along with him. While we're on the subject of secondary cast, this film offers some quirky turns in oddly enthralling characters not the least of which is John Goodman as Whitaker's best friend and dealer. Goodman doesn't hide behind his sunglasses and ponytail but embraces the tackiness of his character's sense of style. Don Cheadle and Bruce Greenwood are always solid, nothing new with their performances here as members of Whitaker's defense team once it becomes apparent he might be looking at time in jail. James Badge Dale comes and goes all too quickly as a cancer patient Whitaker meets in the hospital, a scene that could easily have found its way onto the cutting room floor, thankfully saved if for nothing else than to see Dale give it his all. Flight, as well as those who see it, is also fortunate to have an actor like Washington taking on the central role here, though, that burden of making a hero appear flawed not something new for the Oscar winner. But Washington bounces back and forth between the two roles with a much smoother glide than the film's director. While the scenery and tone of the film are pushing and pulling your mindset without grace, its Washington you can continuously fall back on and observe. He plays weak as well as strong, angry as well as drunken and oblivious, and each new emotion the actor crafts in this character's guise edges the film just a little higher than it is. By the time the film's hokier-than-thou denouement comes around, Washington is required to drop all guards, and his delivery of some lame lines help raise the bar exponentially. It's easy to say, but Washington is the only reason Flight every really gets off the ground. A harrowing crash sequence followed by two hours of substance abuse drama needs strong hands to mold it into something completely worthwhile, and Zemeckis' skill in creating compelling drama may very well have been lost at sea with poor Wilson. 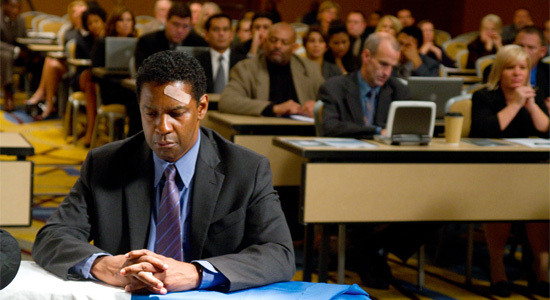 It's not that Flight has absolutely nothing new to say about the subject at hand, but having Denzel Washington as the man to deliver that message is the one, true gift this film has. We can at least be thankful he wasn't wearing tiny, motion-capture balls when delivering that message. What happened to Zemeckis? How could he go from 'Forrest Gump' and other great movies to mediocre offerings off-late? I wasn't implying 'Flight' was bad movie. I was talking about the many flops Zemeckis made like 'The Polar Express', 'Beowulf' and 'Mars Needs Moms'. you're right. it's not mediocre. it's terrible. if you think that watching an awkward, obvious, embarrassing turn on addiction issues is "action", then this is perfect for you. As usual, don't listen to Jeremy...This film is fantastic. fantastic if you like watching a film team awkwardly and narcissistically pay homage to addiction struggles. someone in this chain thinks that an addiction flick masquerading as an action movie is a good idea, but in fact this is an awkward, boorish, overly long debacle of a narcissistic exercise. the "plot twists" embarrassingly telegraphed, the story non-existent hollywood tripe. the only mildly interesting part of this is the 10 min inside the airplane. if you like this, i really don't know what to say. Washington gives the best performance of his career and they were bold enough to not go with the usual alcoholic narrative. It was an insider look at corruption and politics and one of the best character pieces I've seen since The Wrestler. The visuals on the plane were amazing and it was the most realistic plane crash I've ever seen depicted on the big screen. The writing was perfect and the story had even more gravitas because it was based on real accounts. I thought this was a near perfect film and if it wasn't for DDL killing it in Lincoln I think Washington should've gotten best actor hands down.